Horrific images have emerged of the bodies of dozens of bomb sniffing dogs allegedly slaughtered by an American security company. According to the New York Post, the animals were allegedly murdered by Eastern Securities of Kuwait after they were no longer needed when a deal with Kuwait National Petroleum Company (KNPC) expired. 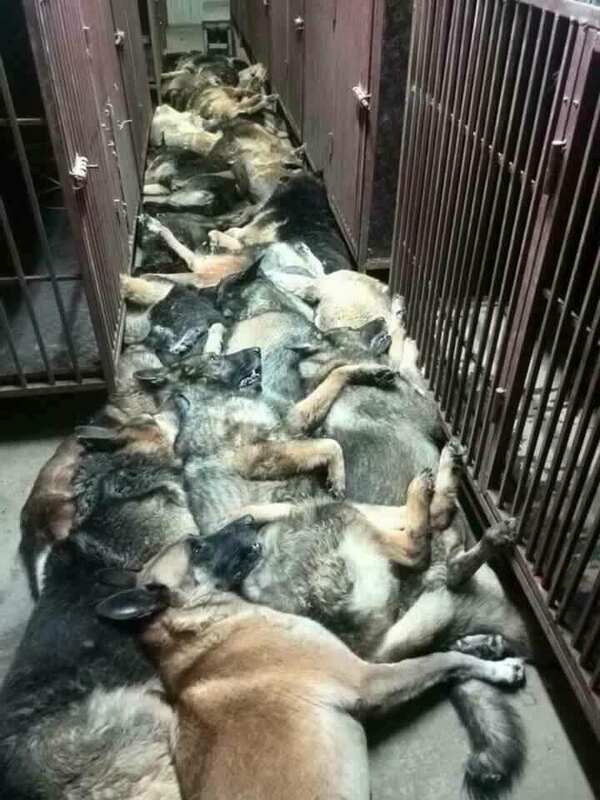 Pictures of the dogs’ bodies piled on top of each other were shared online by Kuwait Animal Rescue Unit. According to an anonymous Eastern Securities worker, the company was meant to euthanise the dogs in small groups but one of the workers decided to kill them all at once. He claims they were killed because they were old or unwell and that Eastern Securities asked animal welfare groups to adopt the dogs – but they refused. A concerned Kuwaiti citizen, Esmail Al Misri, has lodged a criminal case that is now awaiting investigation by the authorities. We know how dogs that are well-fed and well taken care of look. The photos were taken immediately after the incident so we can rule out dehydration as a cause of their sickly state. A petition has now been started to save the remaining dogs from the same fate. A spokesman for Kuwait National Petroleum Company said the company was regretful – but had no part or influence in the decision to kill the dogs.